WHITE, Judith E. (Johnson) age 76 of Bourne passed away peacefully after a lengthy illness on March 17,2019. Judy grew up and was educated in Randolph. She was the devoted daughter of the late Ted and Florence Johnson and became their primary caregiver in later years. Judy is survived by her loving son Mark and wife Diane, grandson James White, granddaughters Victoria Kelly, and Dorothy White, all of Georgia. She was the dear sister of Jacqueline A and husband Robert Felix of Chatham. Beloved aunt of Sean of North Reading, Nathan of North Carolina, Danielle of Kauai, and Samantha of Texas. Judy traveled to Washington, Georgia, and St Croix, which she really enjoyed. 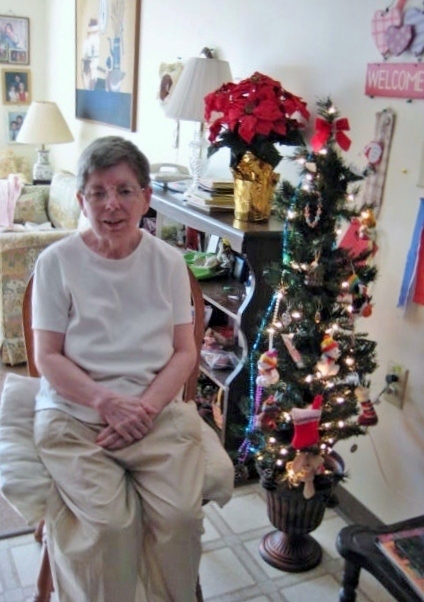 Judy loved her family, bucket hats, to decorate her "home", the holidays, to garden, and old TV series. She was friendly and kind to everyone she met, with a generous spirit and a strong faith. Reposing at the Cartwright Funeral Home, 419 N. Main St., Randolph until 9:45 am on Friday followed by a Funeral Mass at 10:30 AM in St. Mary Church, Randolph. Relatives and friends respectfully invited to attend. Visiting hours have been omitted. Burial to be private at a later date. Should friends desire, memorial contributions can be made in Judy's name to Fidelis Hospice, 25 Railroad Sq., suite 501, Haverhill, Ma 01832.